Don't just throw a New Year's Eve party—host one filled with the best appetizers! Entertaining guests is more exciting when you can serve small nibbles featuring a variety of flavors and ingredients. From elegant seafood bites to crispy fried crowd-pleasers, here are recipes to help inspire you this holiday season and kick off another year of good eating. Now all you need is a good bottle of bubbly or big-batch punch. 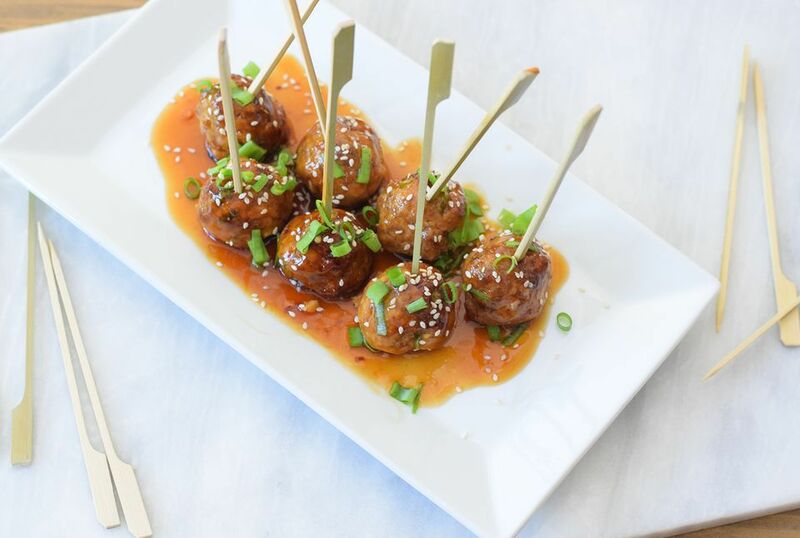 These golf-ball sized beef and pork meatballs are moist and tasty, with great flavor from ginger and scallions. Your guests will love the sweet-savory teriyaki sauce that's easy to whip up. Serve them on a platter sprinkled with toasted sesame seeds and speared on cocktail toothpicks. This legendary baked oysters dish is named after the famous American tycoon, signifying its richness. Oysters in the shell are topped with a buttery breadcrumb topping that's flavored with fresh herbs, Tabasco and Worcestershire sauces, and absinthe, then baked to golden brown. Spruce up your party snacks with this easy recipe for the popular restaurant appetizer. Crab meat is combined with cream cheese and a few flavorings, folded into wonton wrappers, then quickly deep fried for a crunchy seafood snack that's sure to please guests. This traditional Middle Eastern hummus made with chickpeas, tahini, lemon juice, and garlic is rich in protein, not to mention dairy- and egg- free, making it a fabulous vegetarian option. Serve drizzled with olive oil and sprinkled with fresh chopped parsley with crackers nearby for scooping. Prepared puff pastry makes these elegant little party bites easy to prepare. Mild, melting Brie cheese and sweet-tart cranberries are a match made in heaven, especially when folded into flaky, pastry bundles. Baked coconut shrimp deliver plenty of flavor without the extra fat and calories of frying. You dip raw shrimp in beaten eggs to moisten, roll them in seasoned breadcrumbs and shredded coconut, then bake until golden. Serve with Thai sweet chili sauce. You will be bacon guests crazy when they spot this tasty, retro-inspired cheese ball on the table. Cheddar, cream cheese, bacon, scallions, and fig jam are mixed together, shaped into a festive orb, and rolled in crispy bacon bits. When it comes to classic party appetizers, nothing quite beats meaty sausages wrapped in flaky, golden puff pastry. Change things up by using different flavors of sausages. Bacon is the highlight of these meat-wrapped jalapeno poppers. Sweet, smoky, spicy, cheesy, creamy, and crunchy, this appetizer recipe has it all. The poppers cook up super quickly, making them a great option for last-minute gatherings . 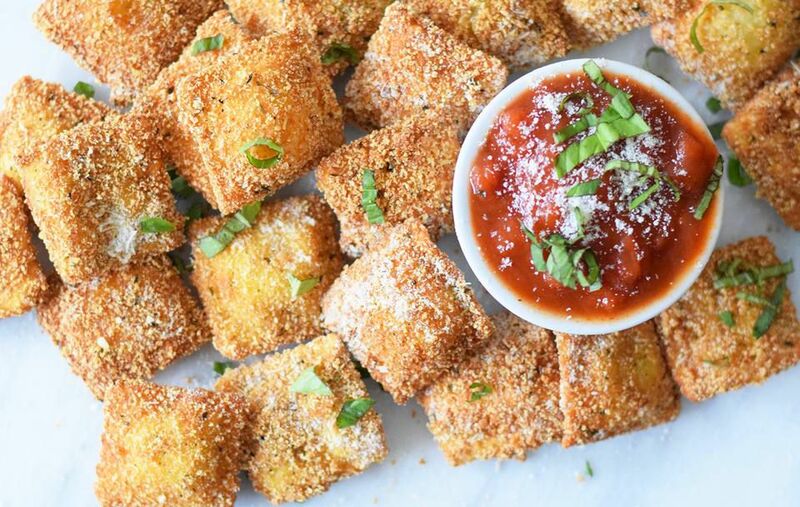 Party guests will flip for these breaded deep-fried pasta bites that start with your favorite pre-made ravioli. Serve them on a platter, sprinkled with grated parmesan cheese and marinara sauce on the side for dipping. Pizza-loving guests are sure to flip for stromboli, a classic Italian dish that's a lot like a rolled-up pie. It's filled with classic pizza toppings, including sausage, ham, mozzarella cheese, pizza sauce, fresh basil, and black olives. Slice it up for easy serving. Whip up this quick-and-easy paté in your food processor. Smoked fish and cream cheese are blended with butter, lemon juice, and a few other pantry staples. Serve it at room temperature, topped with snipped chives, and surrounded by toasted bread slices. Just three simple ingredients create this very delicious hors d'oeuvres boasting smoky, sweet, and salty flavors. Mini sausages are baked in the oven, then wrapped in thick bacon slices and sprinkled with brown sugar. Add a bit of cayenne pepper if you like to amp up the heat. Mushrooms are stuffed with spinach, mozzarella cheese, garlic, and ham, then brushed with butter and baked until they're tender, yielding a mouth full of warm cheesy goodness in this fabulous app. Deviled eggs are always a hit at parties. Just cook the eggs and mix the yolks with a few seasonings, then stuff the mixture back into the egg halves for a fabulous retro-inspired snack. Here's an elegant upgrade on the usual twice-baked potato. Stuff the spuds with prepared shrimp scampi, cheddar cheese, and sour cream and bake until it browns on top. Use crab, shrimp, or lobster for this special-tasting dip that is right at home at the swankiest parties. Cream cheese adds silkiness to this dip, with curry powder and paprika bringing a nice depth of flavor to your choice of mild-tasting shellfish. Serve warm with baguette slices. Salty kalamata olives add something special to this elevated hummus. Serve it in a brightly colored bowl with a sprinkle of paprika or red pepper flakes on top, surrounded by warm pita bread wedges, pita chips, or fresh veggies for dipping. These airy cheddar cheese and bacon puffs are loaded with flavor and a little bit of heat from red and black peppers. Make them ahead and store in the freezer up to one month to reheat at party time. This appetizer is bacon us crazy! Take the tanginess of goat cheese, pair it with the creaminess of avocado, and top it all of with crispy, salty bacon, and you've got a savory snack that everyone is sure to gobble up. Mini beef sandwiches bursting with fantastic Tex-Mex flavors make a welcome appetizer and the shredded meat is simple to prepare using a slow cooker. Serve on slider rolls, layered with your favorite taco toppings. Smoked salmon is a classic New Year's food and these simple salmon crostini are sure to be a hit. Fresh herbs, ricotta cheese, and lemon juice help the smoked salmon shine beautifully. Thai shrimp lettuce wraps make fabulous finger food for a party. Each bite provides a burst of spicy, salty, and sweet Thai flavor that is sure to please. Guests will also have fun making their own wraps with romaine lettuce leaves. Seafood lovers will be thrilled by this bruschetta, which uses lots of garlic, butter, and flavorful crab meat to create a filling that's piled onto toasted Italian bread. The slices are then topped with Parmesan and broiled, for a warm, cheesy finish. Wow your guests when you serve up these sweet, savory, cheesy sliders. The ittle sandwiches feature creamy brie, thinly-sliced turkey and ham, tangy raspberry jam, and crusty French bread and can easily multiply to serve a crowd. A spicy peanut sauce takes these amazing party wings to the next level. It's baked with the chicken and also served on the side for dipping. Use your oven's broiler to prepare these delicious kababs inspired by an Indian recipe. Succulent cubes of tender chicken are soaked in a flavorful marinade with yogurt, then broiled on skewers to form a hand-held appetizer. Serve with mango chutney. There's so much to love about lump crab meat mixed with sauteed onions, celery, and other flavorings, then coated in buttery cracker crumbs and lightly fried into patties. Serve with lemon wedges and mayonnaise. These mini Italian meatball sandwiches are a cinch to prepare with frozen or refrigerated meatballs and are always a party favorite. Roasted red peppers and two kinds of cheese join meatballs on mini slider buns, with optional capers adding extra saltiness. The rich, salty flavor of Gruyere adds something special to classic artichoke dip. You need only a handful of ingredients for this recipe, including jarred or canned artichoke hearts, cheese, yogurt or sour cream, and just a bit of mayonnaise. It gets a slight kick from cayenne pepper. Siu mai is a popular Chinese dumpling that's surprisingly easy to make and looks beautiful on your buffet. The wrappers are filled with mushrooms, shrimp, ground pork, green onion, then steamed, making them a healthier alternative to the usual fried potstickers. This popular party recipe has all the great flavors of spicy buffalo chicken wings in easy-snacking dip form. It combines leftover or shredded rotisserie chicken with jarred hot sauce, ranch dressing, cream and blue cheeses, and some celery for crunch. These party meatballs are made with ground beef and sausage, and flavored with a tangy homemade barbecue sauce. They get baked in the oven first, then go into your crockpot to soak up all that saucy goodness. Keep warm and serve them straight from the slow cooker. This is the classic Italian bruschetta, featuring juicy, chopped tomatoes, aromatic basil leaves, garlic, and olive oil. The recipe include ideas for variations so you can create a whole platter of these tasty slices. Chopped shrimp, panko breadcrumbs, and a little mayo are mixed with seasonings, formed into patties, and lightly fried until golden brown, to create these fabulous cakes. The accompanying Sriracha mayonnaise will have everyone coming back for seconds. This crockpot appetizer only requires five ingredients. Kielbasa sausages are sliced into bite-size pieces and added to your slow cooker with brown sugar, applesauce, mustard, and garlic. Serve with toothpicks and mustard for dipping. These petite cheese balls boast a surprise olive center that will delight party guests. The cheddar-flavored dough is shaped into balls around pimiento-stuffed olives, chilled briefly, then baked until golden brown. Who can say no to fries? This recipe creates thick, crispy potato wedges that are sure to go fast, when you put them out on your buffet. Serve them standing upright for a fun presentation and offer an array of sauces for dipping. Fig crostini is one of those magical appetizers that tastes fancy, but is incredibly easy to prepare. Chopped fresh figs are tossed with a bit of balsamic vinegar and black pepper, then placed on slices of toasted baguette with crumbled goat cheese. These charming miniature quiches with cheddar and broccoli are quick and easy to prepare and bake in muffin tins. Feel free to add your favorite vegetables for extra flavor and nutrition. They can also freeze for up to one month and reheated straight from frozen. This guacamole recipe turns up the heat by adding chopped fresh jalapeno peppers to the usual ingredients for a party dip that will make your guests say olé! Chicken liver paté is an inexpensive and tasty variation on foie gras. Cooked chicken livers are blended in a food processor with hard-boiled eggs, sauteed onion and garlic, and a few seasonings. Make it the day before your party and refrigerate, to let flavors meld. With no breadcrumbs, these large stuffed mushrooms are an excellent low-carb appetizer with plenty of flavor. Blue cheese and cream cheese are combined with green onions and butter to form a savory, cheesy filling. Every New Year's Eve party needs a cheese platter, but do you know what makes a great one? Follow this guide on how to choose the best types of cheese and accompaniments to serve and be prepared to impress a crowd. These smoked salmon finger sandwiches make a quick and easy addition to any holiday buffet. The recipe uses buttermilk white bread, but pumpernickel would also work well. These tasty little baked pizza crostini are sure to go quickly. They're simple for a busy host or hostess to prepare, requiring only a loaf of French bread and your favorite pizza toppings. Put out a bowl of these candied peanuts out at your party and we guarantee it will be empty before you know it. You'll definitely want to make extras of these candied nuts. Baba ganoush is a hearty Middle Eastern spread made with roasted eggplant. This vegan-friendly recipe adds in chickpeas for extra protein, along with tahini, lemon juice, and sea salt for plenty of flavor. Serve it with mini toasts, crackers, or raw veggie sticks. These showstopping deviled eggs with bacon, roasted garlic, blue cheese, and asparagus are a sophisticated take on the traditional appetizer. The presentation is beautiful and the salty, creamy, rich egg filling is to die for. Deeply sweet figs and sharply pungent blue cheese are a winning flavor combination that you have to taste to believe. Drizzle with a little oil and flecks of sea salt for a sophisticated presentation.